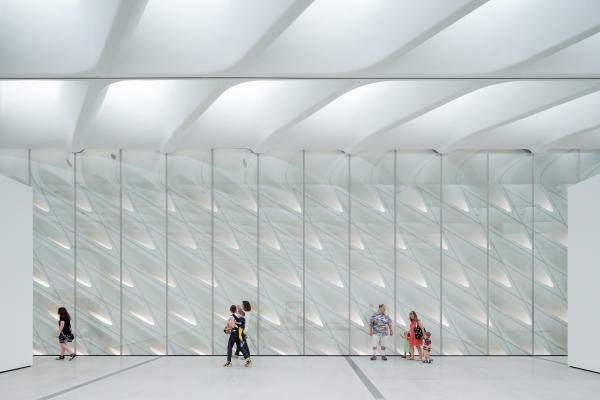 The Broad Museum, on Grand Avenue in downtown Los Angeles, opens Sunday. Admission is free. Eli and Edythe Broad have been collectors for more than 40 years. With skylights and the "interior veil," light streams into The Broad's third floor galleries. The installation of the painting "Like You," by Lari Pittman, 1995. 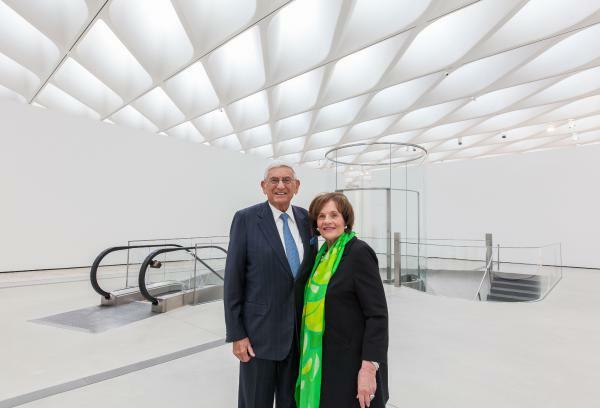 Los Angeles is getting a new contemporary art museum, courtesy of billionaire philanthropist Eli Broad and his wife Edythe. Their free museum opens Sunday. 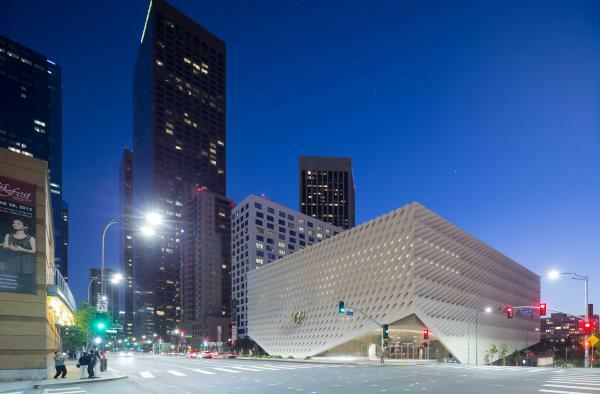 Surrounded by the Walt Disney Concert Hall, the Music Center and the Museum of Contemporary Art, The Broad is already an architectural landmark, with its honeycomb-like exoskeleton. "This shell of sorts, this light filter, this amazing sculptural structure ... enrobes the museum," says Joanne Heyler, the museum's director and chief curator. Traveling up through the middle of the building in the round, glass elevator you can peek inside what's known as "the vault"-- an entire floor storing the Broads' collection of more than 2,000 paintings, photos and sculptures. On the top floor, diffused natural light pours in through skylights. There's work here from Andy Warhol, Jeff Koons, Roy Lichtenstein, Robert Rauschenberg, Ed Ruscha, Keith Haring, Cindy Sherman and Chris Burden. There's an entire room for Takashi Murakami. The collection includes a lot of L.A. artists, Heyler says. Despite the insane art market, the Broads have no trouble purchasing the art they like. "It's simple," says Heyler. "If there's a work of interest, we acquire it. There's no committee process. There isn't a long, drawn-out bureaucratic process to follow." 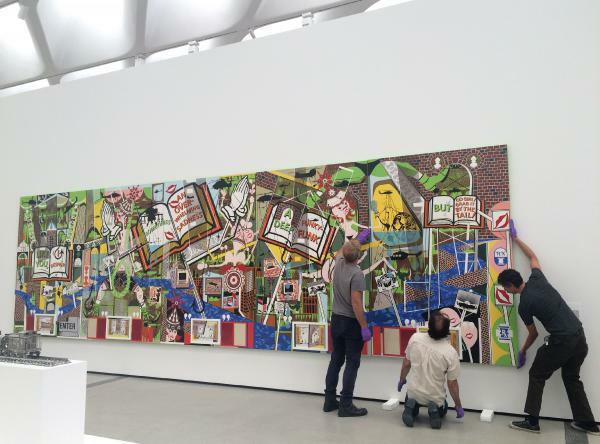 From his office in L.A.'s Century City neighborhood, Eli Broad, 82, can look out over the many of the cultural institutions he's helped fund — the Los Angeles County Museum of Art, the Museum of Contemporary Art, and now, his museum. "We want this to be a gift to the city of Los Angeles," he says. "We've been collectors now going on 45 years." Broad says building his museum took longer and cost more than he thought it would. But he wanted a permanent home for his collection so people could see it and enjoy it. "We wanted to share it with the broadest possible public," he says. "That's why we have free admission." Forbes estimates Eli Broad is worth $7.4 billion. He made his fortune building suburban tract homes, and also running an insurance company. He and his wife bought their first artwork — a van Gogh drawing — and then quickly switched to collecting contemporary art. He says they liked buying works with social or political meaning. And along the way, they've gotten to know the artists personally. He remembers artist Jean-Michel Basquiat, who died of a drug overdose at age 27, smoking pot in their powder room. He says the first time he saw Basquiat's work in New York he was drawn to it "because it wasn't just graffiti, it was very thoughtful," Broad says. He recalls seeing Cindy Sherman's work for the first time in a gallery on Mercer Street in New York. "We followed her career and have 120 of her works," he says. Painter Lari Pittman says considering the caliber and number of artists who live in L.A., he wishes the city had more museums. Ten of his paintings are in the Broads' permanent collection and he's honored to have his work in this new museum. "The Broads have really decided to make something private public ... for free," he says. "That is a huge social gesture. You know, I know a lot of wealthy people. They do nothing." Artist Barbara Kruger also says she welcomes the new museum, which showcases several of her works. "The Broads are truly collectors," she says. "They are not speculators. And they tend to collect works that many would find challenging and engaging on a visual and intellectual level. And I'm sure this will continue as artists continue to make critical and resistant works." The first floor of the Broad showcases newer artists — video installations, a mirrored "infinity" room, a chilling drawing of the police in Ferguson, Mo. The editor and publisher of Artillery Magazine, Tulsa Kinney, says she's glad Broad continues to collect. "I just hope he really broadens his eye towards not just white male artists," Kinney says, "Come on, look, we're in Los Angeles." There's no lack of excitement for the new museum. Even before the doors open, nearly 100,000 art lovers have already booked their free tickets. Los Angeles now has one more reason to put itself at the center of American culture - beyond Hollywood movies, of course. The city is getting a new contemporary art museum courtesy of billionaire philanthropist Eli Broad and his wife, Edythe. Their museum opens this Sunday. And as NPR's Mandalit del Barco reports, it's free. MANDALIT DEL BARCO, BYLINE: The Broad, as it's called, is the newest addition to downtown LA's cultural hub, surrounded by the Walt Disney Concert Hall, the Music Center and the Museum of Contemporary Art. The brand-new museum is already an architectural landmark with its honeycomb-like exoskeleton. JOANNE HEYLER: The so-called veil, this shell of sorts, this light filter, this amazing sculptural structure that enrobes this museum. DEL BARCO: Joanne Heyler, the museum's director and chief curator, takes us up through the middle of the building in the round, glass elevator. Along the way, we peek inside what's known as the vault, an entire floor storing The Broads' collection of more than two thousand paintings, photos and sculpture's. On the top floor, diffused natural light pours in through the skylights, illuminating the art, like the colorful, shiny sculptures by Jeff Koons. DEL BARCO: Andy Warhol's paintings also hang on the walls. HEYLER: All the classic images, "Double Marilyn", the "Elvis," a self-portrait based on photo booth image. DEL BARCO: Roy Lichtenstein, Robert Rauschenberg, Ed Ruscha, their paintings are here too, also work from Keith Haring, Cindy Sherman, Chris Burden, an entire room for Takashi Murakami. Curator Joanne Heyler says the collection includes a lot of LA artists. And despite the insane art market, she says, Eli and Edy (ph) Broad have no trouble purchasing the art they like. HEYLER: It's simple. If there's a work that's of interest, we acquire it. There's no committee process. There isn't a long, drawn out kind of bureaucratic process to follow. DEL BARCO: From his office in LA's Century City neighborhood, 82-year-old Eli Broad can look out over many of the cultural institutions he's helped fund, including the Los Angeles County Museum of Art, the Museum of Contemporary Art and now his museum. ELI BROAD: We want this to be a gift to the city of Los Angeles. We've been collectors now going on 45 years. DEL BARCO: Broad says his museum took longer and cost more than he thought it would. But he wanted a permanent home for his collection so people could see and enjoy it. BROAD: We wanted to share it with the broadest possible public. And that's why we have free admission. DEL BARCO: Forbes estimates Eli Broad is worth $7.4 billion. He made his fortune building suburban tract homes and also running an insurance company. He and his wife Edy bought their first artwork, a van Gogh drawing, and then quickly switched to collecting contemporary art, work, he says, with social or political meaning. Along the way, Broad says, they've been able to meet and get to know the artists personally. BROAD: Jean-Michel Basquiat - unfortunately, he died. But he was at our house, smoking pot in our powder room. But we first saw his work when he was living in a basement and working at an art gallery in New York City. First time we saw the work, we were drawn to it because it wasn't just graffiti. It was very thoughtful. Cindy Sherman, I remember meeting her for the first time, again, in a gallery on Mercer Street in New York. So we followed her career and have 120 of her works. DEL BARCO: Painter Lari Pittman says LA needs more museums considering the caliber and number of artists who live here. His paintings are in The Broads' permanent collection. He describes them as visually loud and cacophonous. He says he's honored to have his work in this new museum. LARI PITTMAN: This is a moment that the Broads have really decided to make something private public for free. That is a huge social gesture. You know, I know a lot of wealthy people. They do nothing. BARBARA KRUGER: The Broads are truly collectors. They are not speculators. DEL BARCO: Artist Barbara Kruger also says she welcomes the new museum, which showcases several of her works. KRUGER: And they tend to collect works that many would find challenging and engaging on a visual and an intellectual level. And I'm sure that this will continue as artists continue to make critical and resistant works. DEL BARCO: The first floor of The Broad showcases newer artists, video installations, a mirrored infinity room, a chilling drawing of the police in Ferguson, Mo. The editor and publisher of Artillery Magazine, Tulsa Kinney, says she's glad Eli Broad continues to collect. TULSA KINNEY: I just hope that he really broadens his eye toward not just white male artists. Come on, look - I mean, we're in Los Angeles. DEL BARCO: She notes the excitement over The Broad. Even before the doors open, more than 85,000 art lovers have already booked their free tickets. Mandalit del Barco, NPR News. Transcript provided by NPR, Copyright NPR.